This class will prepare teachers to work with students in a school garden setting regardless of gardening knowledge or skill. Click here to find out more and to register today! 2 Great Kid's Camps this summer! Soil to Supper is a two week day camp open to students ages 8-11. Camp will be held at the University of Northern Iowa MWF, June 18-29 at Creekside Harmony Educational Garden. 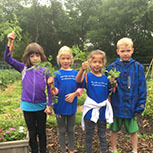 Participants will enjoy six days of learning how science, math, health, and nutrition all play a vital role in growing a garden and a healthy body. Students will explore botany, arts and crafts, world cultures, entomology, microbiology, writing, and cooking while actively gardening throughout the two weeks. Click here to learn more and to register! 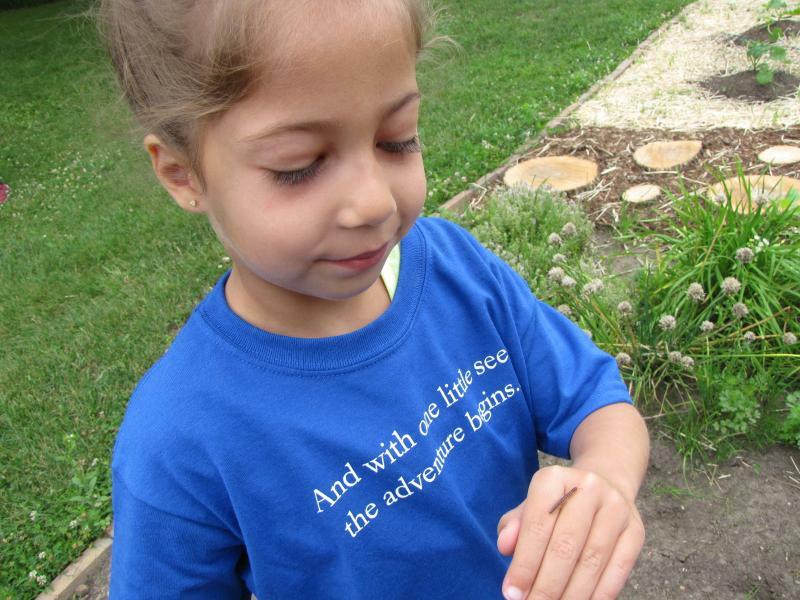 Growing Young Gardeners is a week long day camp open to students ages 5-8. Camp will be held at the University of Northern Iowa July 9-11 from 9-11:30. Campers will engage in arts, crafts, and games while doing hands on gardening activities. Participants will also learn how science, math, and nutrition all play a vital role in growing a garden and a healthy body. To learn more and to register, click here! Have an idea for a sustainable initiative or project? Want to partner with the RRTTC? Click here to apply! Sign up for an RA Program with the RRTTC! We offer an opportunity for Resident Assistants and their houses to learn more about sustainability practices on campus and how students can be involved. We can also do an interactive activity for residents including DIY crafts! 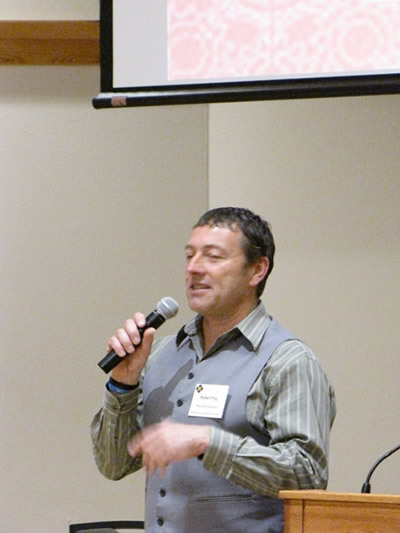 Photos from previous events can be found here. Contact rrttc@uni.edu to discuss a program with our staff and click here for a complete list of activities for the RA program. Earn 1 credit through this three day Garden Workshop at Creekside Harmony Garden. 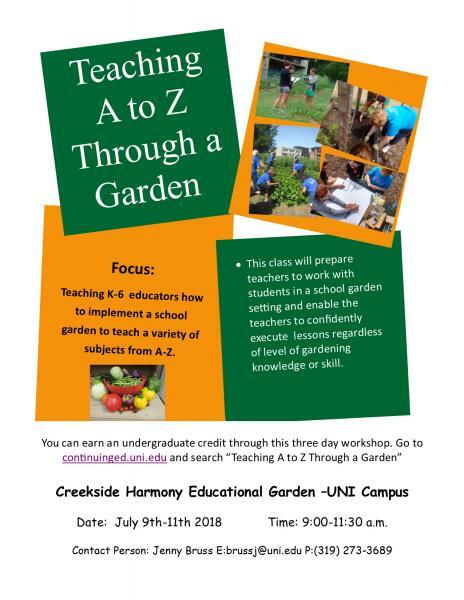 This workshop in July focused on teaching K-6 educators how to implement a school garden to teach a variety of subjects from A to Z through a school garden. Details found by clicking here. UNI celebrated Earth Week during the week of April 20-24. The RRTTC hosted several events for students, faculty and staff, and community supporters. 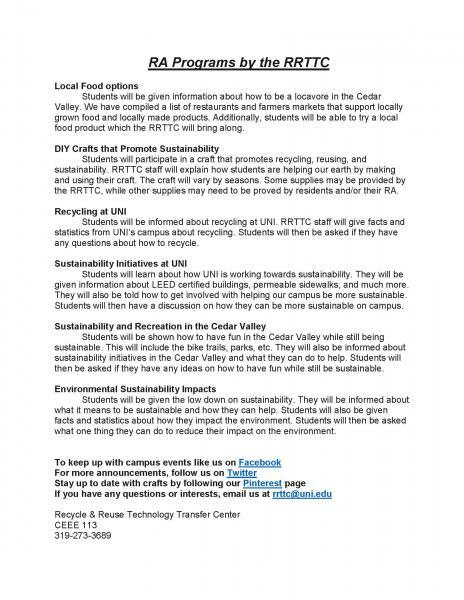 On Wednesday, April 22nd, the RRTTC hosted the UNI Earth Day Celebration. 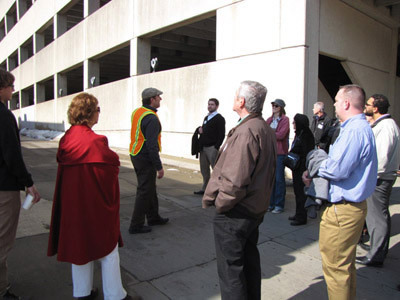 On March 12-13th the Second UNI Sustainability Conference and Walkability Tour was hosted. 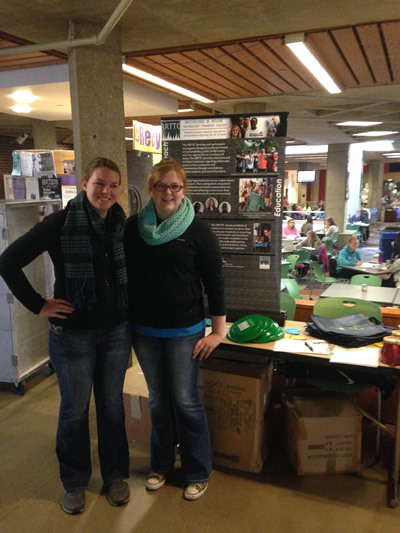 RRTTC Staff hosted a booth in the Maucker Union across from Chats Coffee House. Students were encouraged to make a pledge to take one step towards a greener tomorrow. Students also received a free item to help them start their pledge. The event lasted from 11-1 pm and sixty students attended. The RRTTC met at the North WRC parking lot at 4:00 pm to clean up the wetland. Three RRTTC employees, three people from AmeriCorps Iowa, and one UNI student volunteer came to help. The cleanup lasted from 4:00-6:00 and several large garbage bags were filled with trash. Afterwards, three people joined the RRTTC employees for pizza at the Other Place on the Hill. 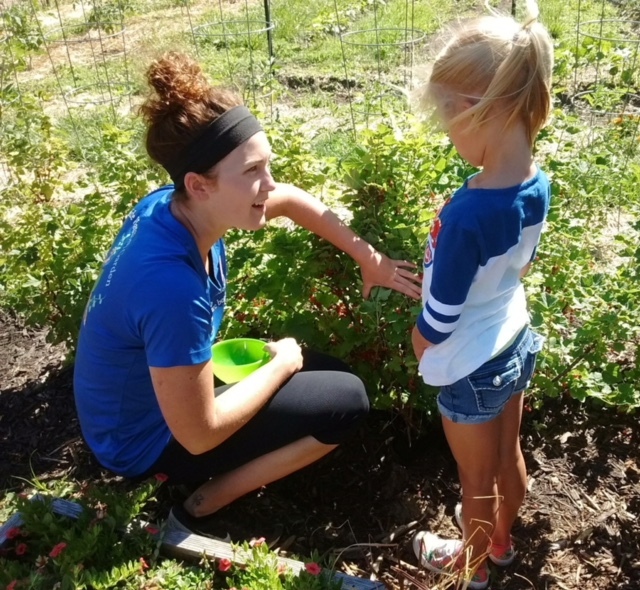 The UNI campus community was invited to Creekside Harmony Educational Garden to take tours of the garden and sample different salsas along the way which were made from produce in the garden. Four different kinds of salsa were offered as samples: mild, medium, hot, and a watermelon salsa. 32 students, 15 staff members, and 3 community members attended the event. 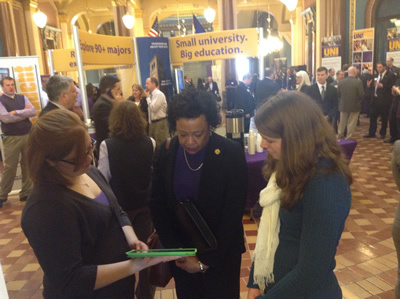 RRTTC Staff ventured down to Des Moines on February 24, 2014 to participate in the UNI Day at the Capitol. The RRTTC had a booth in the Capitol Rotunda along with many other organizations affiliated with UNI to educate legislators and state employees about RRTTC initiatives. Legislators and state employees were invited to take a sustainability quiz for the chance to win a frisbee or reusable coffee mug. On December 4th, 2013 the RRTTC held a plant and craft time for students in Maucker Union. To promote the reuse of items, the RRTTC gathered plates, bowls and teacups that were not being used so that the students could repurpose them by decorating with Sharpie marker. The UNI Botanical center donated 60 small succulents for students to plant in teacups and take to their dorms. About 50 students came through to help to reuse by either planting a succulent or decorating a dish. The RRTTC participated in the Waterloo Farmers Market at the HCVC booth. Children were asked to observe a string of 160 plastic bottles representing the average number of bottles consumed by Americans per year. There were 136 clear bottles, representing the number of bottles thrown away, and 24 green bottles, representing the number of bottles recycled each year by an average American. After sharing the statistics with children via a poster and word of mouth, children were invited to toss plastic bottles into the appropriate bin in order to earn prizes. The RRTTC participate in the Waterloo Farmers Market at the HCVC booth for a second time. Children were asked to look at pictures that corresponded with colored beads. Children were asked to chose the beads that went along with the healthy pictures. Children then used those beads to make a bracelet to remind them to be healthy and good to the Earth. Enjoy these new recycling commercials developed by the RRTTC.